Jenny Kumpf, outpatient clinic services unit clerk, was named Jefferson Community Health & Life’s Caring Kind Employee for 2018. 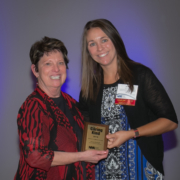 Kumpf was among 76 recognized at the Nebraska Hospital Association (NHA) annual convention on October 26, 2018. Kumpf’s nominates said she exemplifies the Caring Kind spirit with her smile, her eagerness to help both patients and coworkers, and her dedication to go above and beyond in her job. Nominators commend her for taking customers where they need to go, and for working well with all departments for services patients might need. Patients appreciate your willingness to work with their schedules, and communicate any changes. For 39 years, the Caring Kind award has been given to Nebraska’s most caring and compassionate hospital employees. The award honors outstanding health care employees who have demonstrated compassion for patients, cooperation with co-workers and dedication to excellence in their job responsibilities. Hospitals across the state each select one Caring Kind award recipient from within their respective institutions to be recognized during the NHA Annual Convention. Nearly 2,500 skilled and dedicated health care professionals have received this award since its inception in 1979. This year, 76 employees were honored before more than 500 people in attendance at The Caring Kind Awards Luncheon held at the Embassy Suites Omaha-La Vista Hotel & Conference Center in La Vista. The event showcases the exemplary work and care hospital employees provide every day throughout the year. Every Nebraska hospital employee plays a critical role in providing high-quality, cost-effective treatment and ensuring the safety of themselves, their co-workers and patients each and every day. These honorees are star performers through their dedication to patients and teamwork, ensuring that care is safe, quality-driven and cost-effective for consumers, as well as for the organizations they represent. The Nebraska Hospital Association is the unified voice for Nebraska’s hospitals and health systems. The Association offers collaborative leadership, assisting its members to provide comprehensive care to their communities, improving the health status of those communities. For more information, visit the NHA website at www.NebraskaHospitals.org.